Ngari Panchen Pema Wangyal (Tib. མངའ་རིས་པཎ་ཆེན་པདྨ་དབང་རྒྱལ་, Wyl. 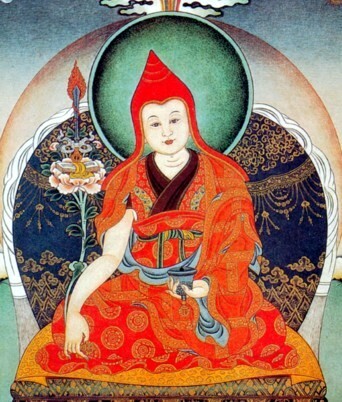 mnga' ris paN chen padma dbang rgyal) (1487-1542) — an important Nyingma scholar and tertön, counted among the previous incarnations of Jikmé Lingpa, who is most famous for his Ascertainment of the Three Types of Vows. His reincarnation was Changdak Tashi Tobgyal. རང་བཞིན་རྫོགས་པ་ཆེན་པོའི་ལམ་གྱི་ཆ་ལག་སྡོམ་པ་གསུམ་རྣམ་པར་ངེས་པ་ཞེས་བྱ་བའི་བསྟན་བཅོས།, rang bzhin rdzogs pa chen po'i lam gyi cha lag sdom pa gsum rnam par nges pa zhes bya ba'i bstan bcos/, dom sum nam ngé, Ascertainment of the three vows. This page was last edited on 25 January 2017, at 19:15.